PennsylvAsia: Digital Humanities and East Asia, January 25 at Pitt. Digital Humanities and East Asia, January 25 at Pitt. 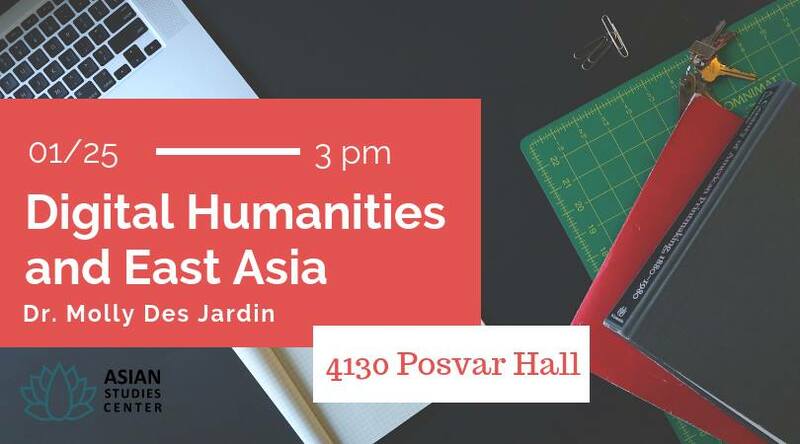 The University of Pittsburgh's Asian Studies Center will host Dr. Molly des Jardins and her talk "Digital Humanities and East Asia" on January 25. We will be welcoming to Pitt Dr. Molly Des Jardin, a Japanese Studies Librarian at Penn to learn about methods, strategies, and experiences in East Asian Digital Humanities. She has designed and taught the very first graduate-level seminar on East Asian Digital Humanities in the English-Speaking world. She is also an expert on text analysis in Japanese. Join us on Friday January 25 at 3 pm in 4130 Posvar Hall for a presentation, chance to ask questions, and light refreshments! It runs from 3:00 to 5:00 pm and is free and open to the public.